I found these at the local ma&pa shop. they are 70mm "twin blade" and spin around 5700 rpm. and mopunt to the standard 60mm mounting holes they seem to push a good amount of air, but I couldn't find a rating for them....nice and QUITE though, compared to the delta hair dryers. Looks like you need to do a review for the abode surly . . .
these ones were awful cheap'so i dont expect too much longevity wise. Last edited by surlyjoe; 22nd February, 2002 at 08:39 AM. Interesting design. I wonder if it's designed to operate against a higher back pressure than a standard fan? Someone put a patent on an design that's a little similar, but operates more like an axial compressor, so can handle much higher back pressures. aidain there is not a axial compressor in existance as far as i know with a pressure ratio greater than 1.5:1 so no single axial fan will ever be able to generate more than 1 or 2 PSI pressure. I slapped one of those on a glaciator I have because it was running on a table in my living room and it was quieter than the stock glaciator fan. It seemed to do a fair enough job. I don't remember the name on the label, but it looks liike the same fan. It's still on there chugging along just fine but it's now put away in the basement where it belongs. My brother has one just like that on his SVC golden gate. It seems to cool very well and its not to loud. I don't have anything to compair it to since I dont goof around with his sytem much. Compared to the standard fan, that's a vastly higher pressure! As you know, it doesn't take very much back pressure to stall a typical PC fan. 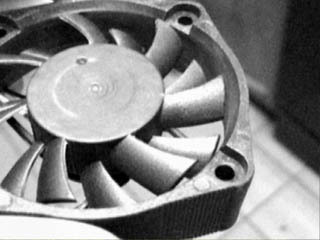 Turbulance helps strip the heat away, but also tends to creates back pressure, when you're looking at heatsinks. I've reviewed one like that (review is now in the post - sorry, Spode) made by a different company (forgot to mention the strange fan thing in the review). When you've got two sets of rotating blades, both rotating in the same direction like that without a stationary stage in between, it is NOT an axial compressor, and will not produce any more than the 1.5psig pressure normal axial fans manage. 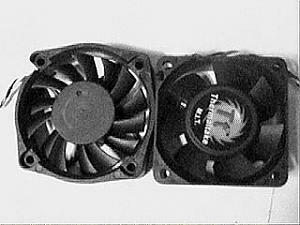 Adding these extra blades is just a way of making a quieter fan at high(ish) revs. 1.5:1 is the pressure ratio limit per stage, but that's why they come in multi-stage flavours - some of these can produce total pressure ratios (across the entire unit) of several thousand to one. 1000:1 = 14 690 PSI if at ISA sea level! :clown: right, there are several types of compressor, and I got my wires crossed about which one I was talking about. There was a question in a thermodynamics tutorial to see if a 1000 bar axial compressor was possible (no). There are a few other kinds - reciprocating compressors can go up to 3,500 psi. These tend to be used to fill gas bottles. Not really. Barrel-type centrifugal compressors can produce discharge pressures of 25,000 psi - but only in liquids. Gases have a tendency to liquefy beyond a couple of hundred bar at room temperature. (That would be a pressure ratio of 1700:1, though I'd bet that they tend to be used in series with lower-pressure compressors). hmmmmmm im sure its more than 30:1 max on em, cos the avon at college runs at that, and its a 50 year old engine! ill talk to em tomorrow. and the heat isnt really useful in a gas turbine engine, as you simply want as much weight of air thrown into it as possible. so cooling it would make it denser, and therefore you could cram more into same area = MORE WOOSH! anyone care to figure out the CFM rating on this? 860 grams a second mass flow?